In which we watch THE Birther book plummet into the darkness, along with Dr. Kate's ability to understand context, and Orly Taitz's understanding of the law. It's been another really slow week in Birtherstan, unfortunately. We have been led to believe that, between seasons, daily life crawls to a standstill, and the country's noble citizens laze on their front porches, drinking weak tea and strong spirits as they dream of hope and change. We just left "Bombshell Book" season and seem to be gearing up for the time of the "All Important Lawsuit," though we also hear that, unique to this country, seasons sometimes skip over one another, and lawsuit season is almost always year round. 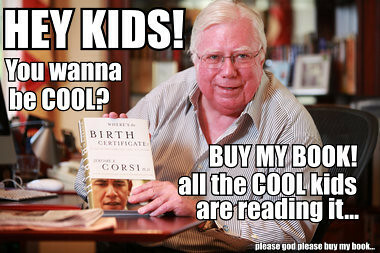 But if it seems like the literary season went by quickly, that might be because, in spite of all of its publisher's statements to the contrary, Jerome "Dr. Feelgood" Corsi's "Where's the Birth Certificate?" seems to be suffering a worse fate than his previous work, "Obamanation." Not even bulk sales have kept the beast above the NYT bestsellers' waterline: it went from 6 to 14 to... um, where did it go? And, over at Publisher's Weekly, it's gone from 9 to 20 -- just below the latest Sarah Palin tell-all book. * Pidgeon found at the Consulate in British Columbia, just over the US-Canada border, a record of a name change from “Barak Mounir Ubayd” to “Barack Hussein Obama” in 1982. * Predicts Obama will throw the NWO under the bus as the Caliph. If true, this might be a gold mine for those who think that our President is the earthly nexus for all strains of evil, everywhere. Unfortunately for them, this is nothing more than Iron Pyrite, dug up out of the feverish imagination of... a German parody news site, two years ago. In the words of my late stepfather, "What you mean when you say 'OOPS?'" On the subject of OOPS, perennial OOPStress Orly Taitz is starting to feel the cognitive dissonance, yet again. Remember last week when she failed to understand what a judge told her, and instead told World Net Daily that she was going to declare discovery and start issuing subpoenas? Well, she's going further down the rabbit hole this week. One can only wonder if the Judge will be as amused as we are. But, when she gets hit with yet another judicial sanction, she can always cheer herself up with the knowledge that she's made the list -- specifically Time Magazine's list, where her blog is one of four they could do without. And that's about it for this week. I'd like to say that, hopefully, we'll have more for you next time around. But that's like hoping for yet more Weinergate at this point. Wouldn't it be nice if that was not the case? But if you're bored, be sure to stop by Obama Conspiracy Theories and have a gander of the excellent dig-up work they did on Jerome Corsi. Do you know all you think you know about this man? You might be surprised at the skeletons he has rattling in his closet.